HACAN has teamed up with University College London (UCL) to enable local communities on the flight path into Heathrowto do something about the problem of noise pollution for themselves. A new free to download app, called Widenoise, on smart phones enables them to collect their own noise readings. Isleworth has been chosen as the project location because it is directly under the Heathrow flight path. The readings taken by the phones can then be mapped and the combined information shared by all. From the launch on 19th June, the project will run for 4 weeks, and local residents are being encouraged to take part. and send in readings. The project will include the first few weeks of the ‘operational trials’ due to start on 1st July. It will give residents a really useful way measuring the impact of the trials. Residents living under the Heathrow flightpath in west London are being asked to take part in a trial to record the level of aircraft noise using smartphone technology. The research is being carried out by University College London (UCL). BBC London’s Gareth Furby has talked to Isleworth resident Maggie Thorburn, Joe Ryle and Christian Nold from UCL and John Stewart of Hacan, a campaign group against aircraft noise. A European Union supported project is due to be launched on Tuesday 19th June in Isleworth at 7pm at Isleworth Public Hall. The project, a collaboration between UCL (University College London) and HACAN (Heathrow Association for the Control of Aircraft Noise), aims to enable the local community around Isleworth to do something about the problem of noise pollution caused by living under the Heathrow Airport flightpath. Recordings will be made through new technology which has been developed for smartphones that will allow easy measuring of noise levels which immediately place the data on an online map and can be shared by all. 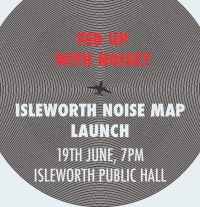 Over a period of 4 weeks starting from the public launch event, residents of Isleworth are being encouraged to record their personal exposure to noise by using the phone application to create a collective local map of Isleworth. The idea is to enable local residents to demonstrate the levels of noise they are actually exposed to based on their own data collection. “What makes this project exciting is that it gives communities the capability of doing something about the problem of noise pollution for themselves by collecting their own noise readings. If the project is successful we could have thousands of people under the Heathrow flight path doing something to combat their concerns around noise from planes”. HACAN (Heathrow Association for the Control of Aircraft Noise) has teamed up with University College London to enable local communities to do something about the problem of noise pollution for themselves by collecting their own noise readings. Isleworth has been chosen as the project location because it is directly under the Heathrow flight path. Recordings will be made through new smartphone application that will allow easy measuring of noise levels which immediately place the data on an online map and can be shared by all. Widenoise is a free smartphone application that you can run on your Android or iPhone which can send sound level data to the Isleworth noise map. The project is supported by the European Union research project Everyaware and Mapping for Change. Posted: Tuesday, June 19th, 2012. Filed in News about Airports, Noise News, Recent News.